Love, love, love that you used Big Blooms, perfect! This is my favorite card from you! I adore the sponged background - that big full moon and of course the coloring on the bun bun! Thank you so much for all your creative projects for this release. Wow !!! Your sky is amazing !!! Great great technique !!! The overall look of the card is adorable but sadly I'm French and I don't understand that pun..?? Actually I just understand the pun !!! Boos = booze (if I spell it correctly) = alcohol ! Lol !! (I hope the reply doesn't count as an extra entry for the drawing, because I've just hit the button as soon as I got that pun ! If it is, would you mind delete it ? Because I know that I try to delete it myself it actually remains my name and and a message (yes a message that says that the message has been deleted..... but still so I'm assuming it counts as message !!?!!?! I hope you'd understand me.... lol !! Marjorie- you are too funny!! No worries about the extra entry and I understand you completely! Oh my goodness Deborah, THAT is just FANTASTIC! Very well done! I love everything about this card, from the amazing image, to your background. Just perfect IMHO! THUD! Just a breathtaking card, Deborah. Your technique is terrific. I actually thought it was a photograph. Just discovered you through Michele's blog and what a treasure of delight I've found here! 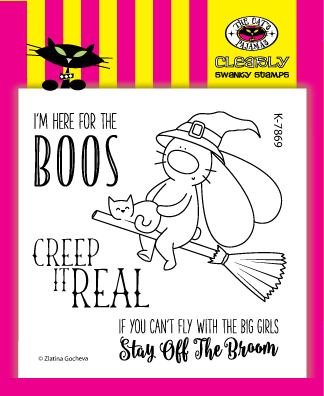 Your card is sheer delight; the night sky is perfect for your Halloween bunny and giggle-inducing sentiment! 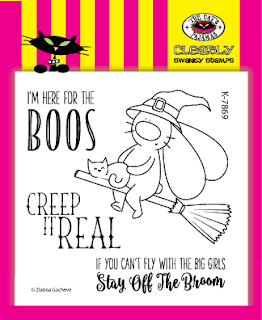 Spook-tacular!